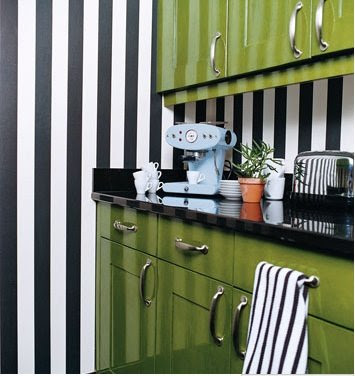 I am not sure there are words to properly express my love for this kitchen featured in this month's Domino. I almost shivered with glee when I saw it. There is no way the husband would ever agree to this in my wildest dreams, so I am resigned to admire it from a distance (sigh). omg, i love it!! only if the green was red! Love it!! Favorite color combo! Like your wedding - my colors are green, black and white. Did you go to the show @ the mart? Pick up anything good? This is gorgeous. I would love to make coffee in this kitchen.